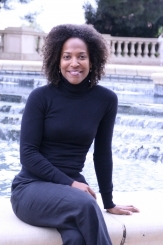 Libby Lewis earned a Ph.D. in African Diaspora Studies with a Designated Emphasis in Women, Gender, and Sexuality Studies at the University of California, Berkeley where she also earned a B.A. and M.A. in African American Studies and an M.A. in Journalism. As an Institute of American Cultures Postdoctoral Fellowship recipient with the Ralph Bunche Center for African American Studies at UCLA in 2009, she continued her research on the television news media. Her current work-in-progress is a book entitled The Myth of Post-racialism in Television News, which is under contract with Routledge Press. The book examines how Black television news journalists negotiate race, gender, and sexuality in a corporate newsroom culture and is informed by her experience as a television news anchor/reporter for CBS and NBC. Her teaching reflects several areas of expertise including: Media Studies, Critical Race Theory, Cultural Studies, Gender and Sexuality Studies, African Diaspora Studies, Ethnic Studies, American Studies, Qualitative Research Methods, and Journalism.